We had our annual Long Table Dinner in the greenhouses a couple of weeks ago in aid of the East Cork Slow Food Educational Project. It was completely sold out with a waiting list of people eager to come if there was a cancellation, even at the last minute. Six nationalities travelled here for it: English, South African, American, Swedish, French, Swiss... as well, of course, as a large Irish contingent. This is always a wonderful time of the year in the Cookery School gardens, with everything looking lush and luxuriant. But I love to have the added excuse of a special event to polish everything up an extra notch. The preparation for this event starts several months ahead. After the early potato crop was harvested, Tim and the garden team planted grass seed in a couple of bays of the greenhouses. This lush lawn creates a beautiful green carpet for the Long Table Dinner. The field kitchen in the neighbouring bay was beautifully screened off with fresh beech branches and willow lattice. Pam was in charge of the table operation. A few students from the summer Twelve Week Course had asked to stay on to help at the dinner. They loved the experience, and being able to see the behind the scenes preparation, cooking and serving of a summer feast for a hundred people. The weather forecast was pretty grim, so we all held our breath... Guests started to arrive at 4pm and Colm McCann and his team had some cava with elderflower or rhubarb cordial and fresh mint lemonade ready for the guests. 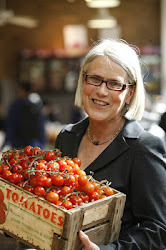 Emer and Pat grilled sourdough bread and topped it with heirloom tomatoes and basil, or scrambled organic eggs and Ballycotton lobster. Despite our apprehension, we were fortunate with the weather. About an hour before the guests arrived there was the sort of sudden downpour that we've become accustomed to this "summer". But after that it was blue skies all the way. We welcomed the guests and thanked them for supporting the East Cork Slow Food Educational Project - and explained we are saving up to convert a disused shipping container into a prototype teaching kitchen for local schools to teach their pupils how to cook the produce they grow in their school gardens. After the aperitif and nibbles, the guests divided into a couple of groups for a walk through the organic farm and gardens. We explained that the Cookery School and farm are completely integrated: the School is our indoor classroom, we use the farm and gardens as an outdoor classroom. We showed them the photovoltaic system that generate electricity for the School, even on dull days, and the student beds where local children learn how to sow seeds and grow vegetables and herbs. Many were also fascinated by the dairy, where our Jersey cows are milked and the butter, buttermilk and yoghurt are made. We wandered down through the herb garden, the wild flower meadow, and the vegetable and fruit gardens, arriving at the glasshouse just minutes after 6pm. At this time of the year it looks like the Garden of Eden with kiwi and passionfruit overhead, and a wonderful variety of aubergines, sweetcorn, chilis, salad leaves, peppers, beans, heirloom tomatoes, beets, zucchini ... as well as peach, fig, nectarine and grapevines around the edges - so beautiful. The Gardeners - Rupert, Sheanie and Colman - were playing trad. music as we arrived. People took their seats. It was all very convivial, as is the nature of Slow Food events. There was no seating plan, so people could mix and mingle and make new friends. We started with a Garden Leaf and Herb Flower Bouquet with Almond and Marjoram, Grape and Elderflower Mist served in little glasses, which had been assembled minutes earlier from the freshly picked leaves. There was lots of freshly baked Ballymaloe Brown Yeast Bread and Jersey butter from the farm. The flavour of homemade butter was a trip down memory lane for many guests. and Mustard Seed Pickled Cucumbers. The main course was also sensational, in the words of the guests around me: Grilled Breast of Nora Ahern's Duck with Stonewell Tawny Cider, Roast Nectarines and Mint. Rory had also braised the duck legs and wings with Indian spices, Llewellyn’s balsamic vinegar and tomatoes. That dish too was enthusiastically received. The Jersey butter and sea salt on the table embellished the floury new potatoes, a variety called Colleen, and the green beans which had been dug and picked not more than a half an hour before dinner. Next the cheese course: Kinoith Farm Dairy Labne made with dripped natural yoghurt, served with Radishes, Savoury, Highbank Orchard Apple Syrup and Homemade Cheese Biscuits. Needless to say, everyone had to have a taste, or rather several, of everything. Robin Wight, one of the guests who has been coming to Ballymaloe for almost 50 years, gave a touching speech and proposed a thank you toast to my mother-in-law Myrtle Allen (pictured below), and my late father-in-law Ivan Allen, who opened Ballymaloe House restaurant in 1964, without whom none of us would have been gathered together. 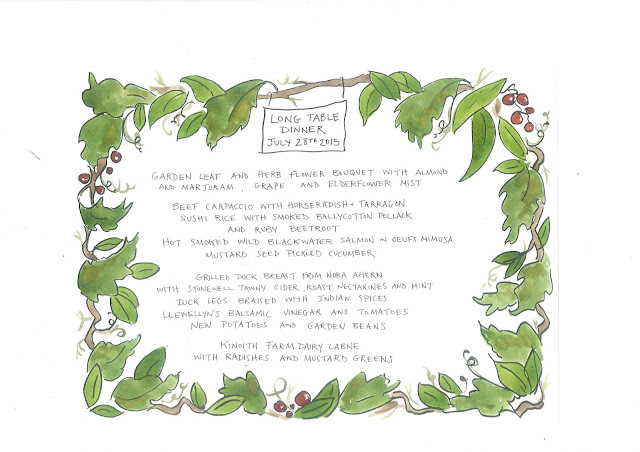 It was a truly memorable dinner, and a sumptuous celebration of summer produce. A big thank you to Tim and his ace team in the farm and gardens, Rory and his talented crew of Ballymaloe cooks, and each and everyone else who worked so hard to make it such a special night. Everything looks sensational! Cannot wait to attend the 12 week course in September. See you then, Darina! Wow! Just discovered your blog. That feast looks just perfect. Just gorgeous! Students work hard on a study and they do not complete the assignment at the right time. So we provide the best assignment help service. Students can easily hire an expert's team. Experts are any time support you and they write best and unique content. Directly hire our experts at Australiaassignmenthelp.com. Australia assignment writers offer assignment writing services on students assignment help for Australia's students because Australia has high-quality of education and not all students are able to create their assignment so we provide help in assignment writing on the low range. Glad to see pics of summer feast in Eden Garden. Essayassignmenthelp is known for handling every type college assignments for students. With an extensive experience in assignment writing, we deliver premier assignments within the given deadline.